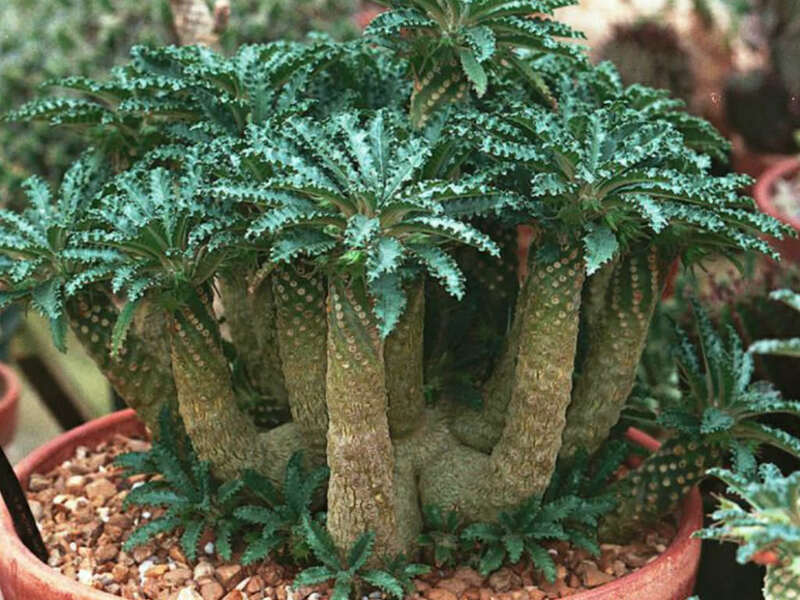 Dorstenia are a strange caudex forming genus of plants from north east Africa. They tend to spread out along the base, just above the soil and have some to many branches pointing upward. They usually have attractive green non-succulent leaves of various shapes depending on the species. Some species have sunflower like flowers that spray seeds all over your greenhouse. Small Dorstenia plants pop up in other pots. Dorstenia foetida does this and is the most common species found in the market place. However, most of the other species are extremely rare and somewhat difficult to grow. Dorstenia gigas, from the island of Socotra in the Arabian Sea, prefers a mild humid, but not rainy, coastal climate. It will wilt if exposed for extended periods to excessively high or low temperatures. Below is a short list of highly sought after Dorstenia species. Light: They needs bright light or partial to full shade. Water: During the growing season, Dorstenia appreciate a fair amount of water but allow the soil to dry slightly between watering, making sure that they never dry out completely. During winter months they should be given very little water. Soil: Well-drained soil mix that must not remain soggy for too long. Fertilizer: They are fertilized once during the growing season with a balanced fertilizer diluted to 1/2 the strength recommended on the label. Usually propagated by seed. Many species are self-fertile. Their seeds are expelled explosively from the mature seed heads and liable to populate pots several feet away. They can also be propagated by cuttings. The spring weather, with a high temperature swing between the day and night hours, and pretty frequent rains, can favor the development of fungus diseases, which should be treated preemptively with a systemic fungicide. At the end of the winter we suggest a wide range insecticide to prevent the attack of aphids and cochineals. Dorstenias are warm loving plants and they need a bit more water than regular succulents. They need well-drained soil mix and their water needs vary depending on the season of the year. Water regularly to abundant form spring to autumn. Allow the soil to dry slightly between watering, but make sure that they never dry out completely. During the winter months they tend to go at least partially dormant. During this period, water very little. Giving plants a warm, sunny position can result in beautiful compact growing plants. Fertilizing plants once in a while during their growing period with a high potash and phosphorus fertilizer is recommended.